The new Cyn.in version 3 is finally here and I am excited to announce its public availability. 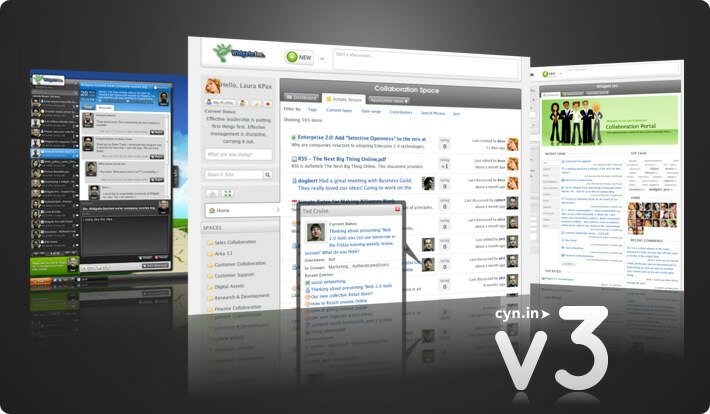 Cyn.in v3 brings with it great new features, tons of fixes and performance improvements and an all new user interface. It has been an exciting year for us since the last major release of Cyn.in. I have been overjoyed with the response and adoption of Cyn.in within organizations spanning across nearly every major vertical and every continent across the world. From successfully enabling a company wide collaboration platform for businesses with over 50,000 employees to connecting together a 4 person strong startup, we have applied Cyn.in to a broad spectrum of requirements and learnt a great deal in the process. Our key motivation while designing Cyn.in v3 came in from the needs of our customers and the community. Demanding market situations have caused businesses to push collaboration tools harder towards increasing efficiency and productivity while reducing costs. Cyn.in v3 was designed with a focus to speeden communication and facilitate rapid and seamless knowledge sharing. Cyn.in evolves and changes the way knowledge workers communicate with each other, and in some cases, especially in very large organizations, this change could curb widespread adoption. The all new user experience has been redesigned from ground up to eliminate the learning curve and accelerate value discovery. One of the most asked for features has been discussions independent of the contextual discussions as comments. The new discussions application in Cyn.in is the perfect tool to initiate conversations and fluid knowledge exchange. You can now share video and audio content with your team using Cyn.in. Its like having a secure internal Youtube for your organization. Uploaded media can be further embedded into other Cyn.in applications like wikis and blogs. The “Add New” interface in v2.1was simple but wasn’t ALWAYS available. With v3, you can add spaces or content from anywhere, with a click. The Quick Adder bar is always available at the top of every Cyn.in screen enabling you to create new content in a space of your choice. If you are looking at starting a conversation or just asking a question, use the discussion text box to post it without navigating away from the page. Knowledge workers spend the likes of one day per week searching for people or information - connecting to people through people while looking for answers. V3 introduces faceted search and navigation to speed up information retrieval and allow users to filter down quickly to the answers they need. Faceted filtering allows you to multi-dimensionally slice-n-dice information in a manner that best accommodates your specific needs. Customers told us they wanted more flexibility in the Spaces - freedom to select application types in a space. Now you can turn on/off any application in a Space and even define the default view of the Space. That means in a Space you can enable discussions and files or disable wikis. Or, you can turn off the dashboard and choose any application to be the default view of that Space. Encourage conversations and capture innovative ideas by getting peers to rate / vote for content in the site. Top rated items bubble up to the top and by applying the “wisdom of crowds” concept, top rated items can complement decision-making processes resulting in better decisions. Get your own dedicated virtual servers in the cloud hosted exclusively with Amazon Web Services. We will not be offering shared instances of Cyn.in from this release. Each Cyn.in On Demand package with now provide a dedicated server instance in the cloud. This makes Cyn.in On Demand a true ‘Appliance in the Cloud’ offering and provides much stronger control and security to our customers. We will continue to provide the shared instance offering to our existing customers for the next one year. A select set of customers have been using v3 actively in the production environment for a while now, and their response has been encouraging to say the least. We look forward to hearing your feedback. Presenting the brand new Cynapse.com and the Cynapse Community! Customer feedback and the open source community are the top innovation drivers at Cynapse and have been instrumental in the success of Cyn.in. We intend to take this interaction to a whole new level with the brand new Cynapse.com with a unified community built using Cyn.in integrated with the versatile Drupal CMS. In the true spirit of open source, we invite Cyn.in users, enthusiasts and developers from across the world to come and share your ideas, provide feedback about Cyn.in, discuss and ask questions in our Cyn.in powered Community.